Adda52 has been exploring unique ways to cater to players in India. After launching super-value tournaments like Gayle Storm, Godfather, Mega Suits, Adda52 Millions and some crazy leaderboards, India’s largest poker site has now surprised poker community by announcing ‘National Poker Championship’ (NPC), a unique pan-India event that seeks to bring together poker enthusiasts from all over the country and offers a chance to become India’s ‘First National Poker Champion’. 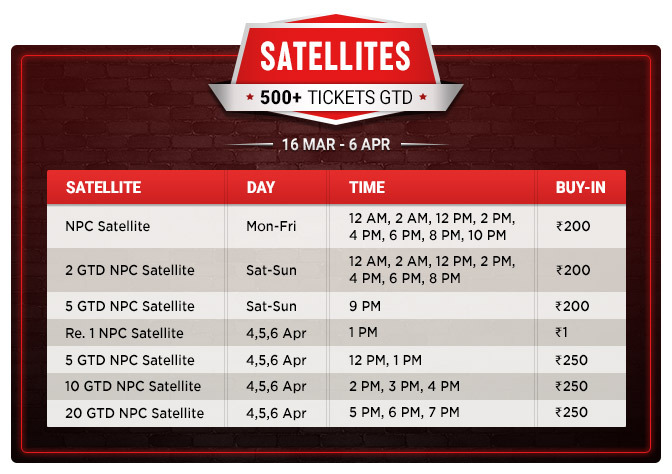 National Poker Championship with 1 Crore in guaranteed prize money takes place from 4th to 7th April with 3 starting flights on first 3 days (4th, 5th and 6th April) and the NPC Final Day starting 7th April at 5 PM. The most exciting thing about the tournament is that it guarantees a mind-blowing INR 1 Crore prize pool with free entry via state level qualifiers & paid satellites of buy-in just INR 200. For players looking to directly buy-in into the championship event, Adda52 has once again set the bar with just 2,500 buy-in. With such an incredible value at such an attractive buy-in, this pan-India poker sensation is going to do justice to its name! Adding to the delight of poker players, Adda52 is offering players multiple ways to enter the upcoming championship event and fulfill their dream of becoming a ‘National Poker Champion’. Players who win a seat to the Championship event can play in any of the 3 starting (Day 1A/B/C) flights, which entail INR 2,500 per entry. Each starting day will begin with 15K stack. Blinds will begin at 25/50 and each level will be of 10 minutes. Each starting day, the game will be paused after 30th level. All survivors from the 3 starting flights will be registered for the NPC Finale on 7th April starting 5 PM. With a mind-blowing 1 Crore GTD prize pool at just INR 2,500 buy-in, the Championship tournament is expected to attract a record turnout and set a new benchmark in the Indian online poker history. For details of the marquee tournament and satellites for the same, check out this link HERE!